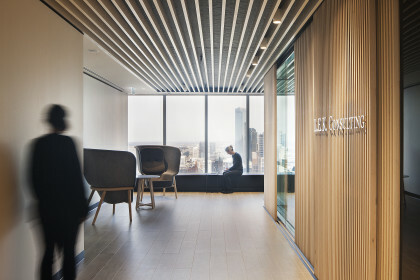 Linear were engaged by LEK Consulting from strategic briefing through to Change Management to help transition their Melbourne office towards a higher performance workplace developed around the principles of flexible working. This was an opportunity to position the business as a top tier business advisor and create a solution that reflected excellence, professionalism and confidence. It allowed LEK to rethink the way their people worked and interacted, and to enhance performance and connectivity nationally and globally. The design solution enables an increased sense of team and connectedness as well as giving them a strategic advantage by absorbing business change and growth. The new workplace encompasses key principles of Activity based working and high end audio visual and meeting facilities. A key driver for this project was the well being of their people, reinforced at leadership level by allocating the best views to their people rather than to formal meeting spaces.This approach further demonstrates the strong culture of LEK and the genuine comradery in the business. The look and feel is contemporary and timeless, with a creative edge. LEK are known for being more creative than their competitors and we showcased this throughout the design by incorporating a variety of spaces that inspired creative thought and enabled them the freedom to excel. These were strategically located at arrival points and amongst the formal client spaces, to further reinforce this to clients and allow glimpses into the project spaces to see LEK people working creatively. Slatted timber sliding screens allowed a level of transparency into these spaces whilst still providing the ability to morph into more privacy when required. Patterned floor elements were used to reinforce a creative energy in areas were staff came to socialize and recharge.